Because they are so detail-oriented, Virgo star sign is best known in astrology for their meticulous nature. So for Neptune in Virgo, their inspiration comes from paying attention to the smallest aspects of any given situation. Although they have trouble seeing the forest through the trees, they also recognize things others may have missed. Neptune represents instinct, illusion, spiritual understanding, confusion or addictions. 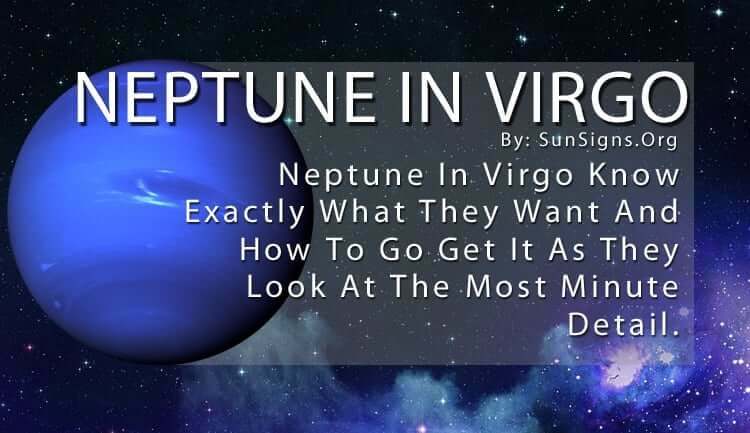 For Neptune in Virgo, they know exactly what they want and how to go get it. Their focus is on getting everything right, down to the most minute detail. When they have an idea that excites them, they create a plan and figure out the most efficient and effective way to execute that strategy. And depending on the idea, they will add some personal touches to make it their own. (Learn more about Neptune symbol meanings). The Neptune in Virgo people is most creative when planning an event, for they often set up a theme and go overboard with food, games, and party favors that connect with the theme. And whatever you need them to do they will do it, for they are very responsible. They like taking care of errands because they have a specific way of doing things that they feel gets the job done right the first time. The way to spiritual enlightenment for the Virgo Neptune sign is to let go of their idealistic tendencies and allow for change to happen. They have such a need to be in charge of things that they sometimes miss out on fun surprises they weren’t expecting. Spontaneity can be a good thing, and it’s important for them to be able to go with the flow at times. It’s good that they know what they want and they have a clear path to achieving their dreams. But they won’t get there unless they account for possible obstacles that can show up unexpectedly. But while Neptune in Virgo doesn’t need much to get their creative juices flowing, they can place tough expectations on others if they don’t adhere strictly to their plans. They can be very critical on those they love, but this is only because they also have such high expectations for themselves. They want to be the best at everything they do, and they want those around them to be the same. But this kind of perfectionist attitude can get in the way of achieving their goals or helping others to achieve theirs. They have an ideal version of everything in life that they strive to create, and this can bring about confusion and disappointment if it doesn’t work out how they wanted it to. It’s difficult for Neptune in Virgo to shake off that kind of negativity, which can cause mental or physical harm if they aren’t careful. They can take on too much, and when they start to lose control over things they can spiral down into depression. Rest and relaxation are important to rejuvenate them and help them get back on the right track. If they can learn to let things go once in a while they will be much happier. To make sure they don’t lose their focus or ability to come up with new ideas, they need to let down their guard and allow creativity to flow freely. The best way to inspire others is to show them your dedication, and your capacity to navigate around a difficult situation.